In 1998, when I was still in my twenties, I self published a family history of my ancestor Jacob Troxell. The manuscript was not fancy by any means. I wrote and typed the document on a simple word processing typewriter as we did not own a computer. I copied the pages on the xerox machine at work, then took them to Kinko’s to spiral bind them together. 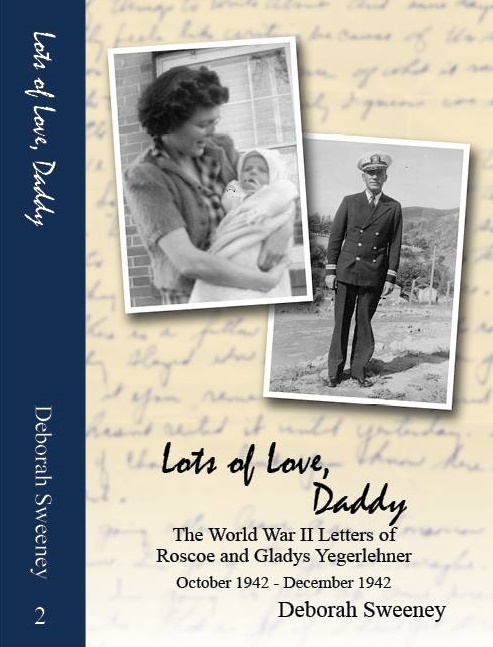 I wrote dozens of letters to various family members, in the beginning, to gather information for the book, and then later, to sell copies of my precious manuscript. Even then I was thinking ahead when I donated a copy to the Allen County Public Library in Indiana. Today, the book can be found by searching WorldCat. Back then, I was a relatively new genealogist, but I knew the importance of numbering systems and including my sources. The book was not footnoted, however, but modeled on the style of the Mayflower silver books. Each descendant was assigned a number, followed by their full name with an accounting of their lineage back to the original ancestor or immigrant. Biographical information and a list of known children came next. At the end of each entry, a list of references was included. 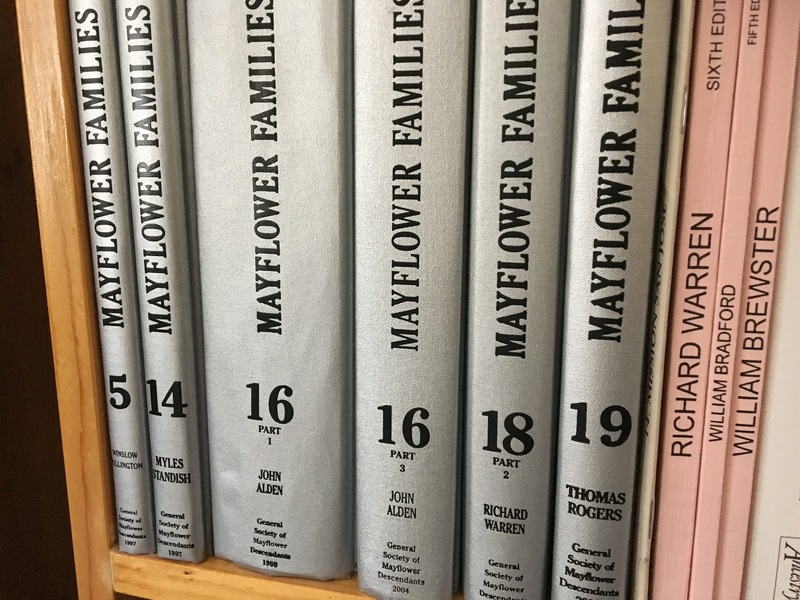 The Mayflower books have evolved since then, with later volumes in the series using inline references instead of footnotes. As my skills have developed and evolved in the last 18 years, it has become more important to me to revise my first manuscript. I waffle between embarrassment and pride in my early accomplishment. The state of Indiana celebrated its bicentennial during the year 2016. As a result, there was a push to release state historical documents into the public view. 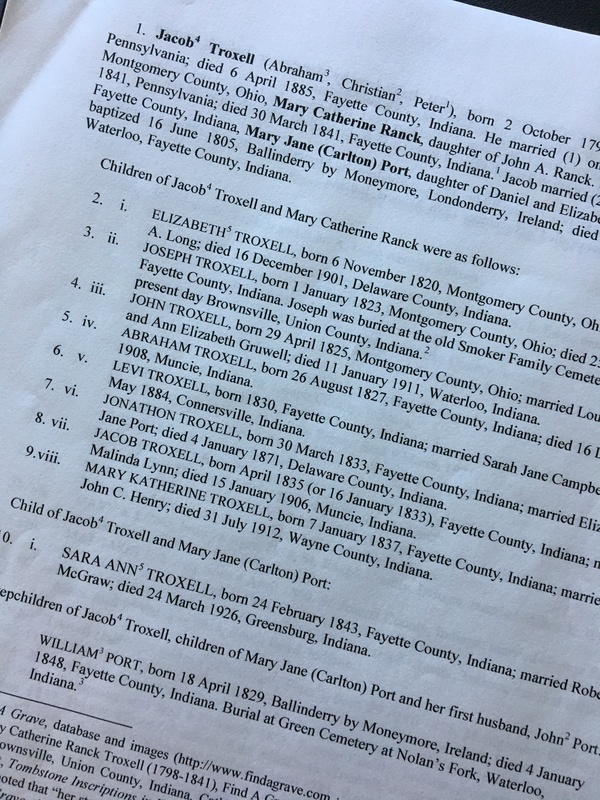 Last June, while I was at SCGS’s Jamboree, Ancestry released several Indiana related databases, including but not limited to, death, marriage, and birth records. Overall, this has been a huge boon to my research as three of my four grandparents were natives of Indiana. Many of my maternal grandfather’s ancestors were among the earliest settlers of the state, particularly in the county of Fayette. Jacob Troxell was one of these early pioneers, arriving in the mid 1820s. His family belonged to the wave of settlers who moved west from Pennsylvania into the Miami Valley of Ohio during the first decade of the nineteenth century. 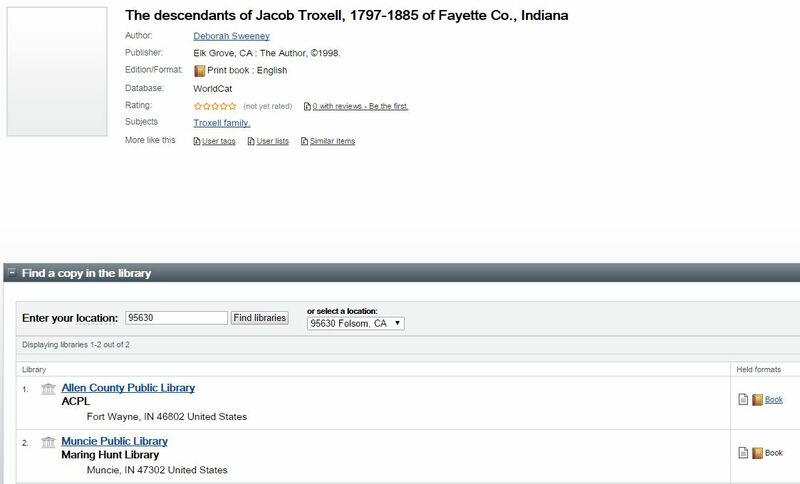 As a young child (or teenager), Jacob Troxell settled outside of Dayton, Ohio. As the United States expanded into Indiana, prosperous Daytonians began purchasing land in Indiana. Abraham Troxell, Jacob’s father, bought land in Waterloo Township in 1826 and Jacob relocated his young family to Fayette county. A few years later, Abraham deeded the Fayette county land to Jacob. So where do I start? As my friends and family will attest, I have been bombarding them with updates on this enterprise. Over my Thanksgiving break, I pulled out my copy of the Troxell manuscript. I began to construct a new framework (or outline) for Jacob and his next three generations of descendants, based on the original manuscript and all the subsequent research I have added to my database in the last two decades. My outline was simple, recording only Jacob and his descendants, spouses, and children, with only birth, marriage, and death dates. Overall, I prefer the NGS Quarterly system of numbing. (For more information on genealogy numbering systems, check out Numbering Your Genealogy by Curran, Crane, and Wray.) In this draft, I stopped to write very few footnotes as I wanted to focus on constructing the outline. Those footnotes that I did write were generally for infants who died young. There would be little for me to add later on. At this point, the outline has become my research plan. In the next phase, I transferred all the names of the direct descendants to an excel spreadsheet. In four generations, Jacob’s progeny increased to 206 known individuals, including those of his four step-children. 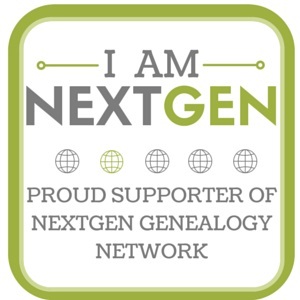 Currently, I am collecting obituaries with the goal to locate as many newspaper articles, obituaries, and death notices of these descendants as possible, with about 50% tracked down already. This week I expanded the spreadsheet to include spouses. 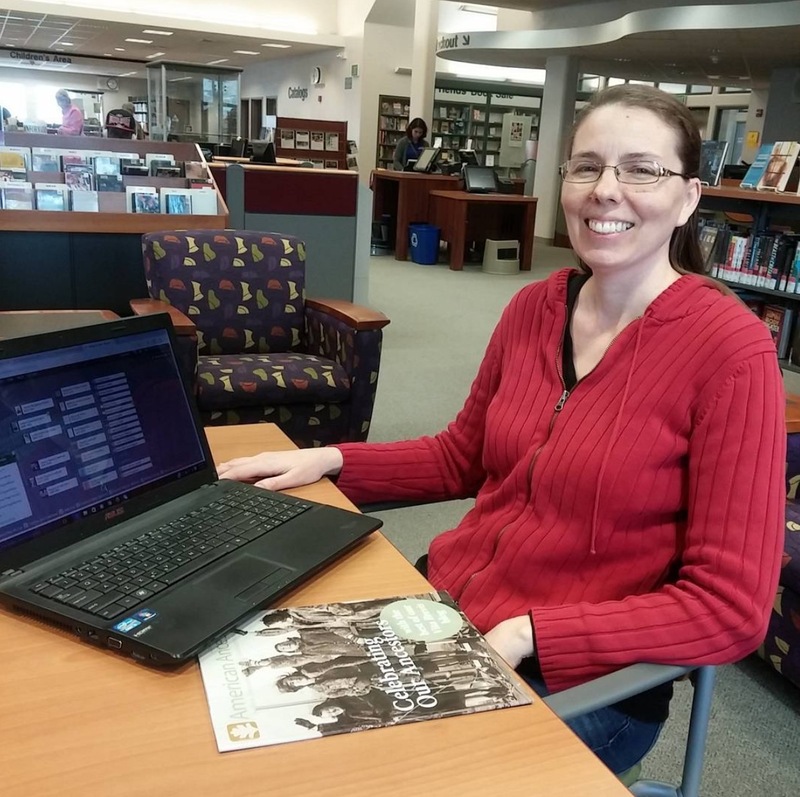 I have been delighted to discover many of Indiana’s county libraries have improved online research request forms as well as online obituary indexes. St. Joseph county, Allen county, and Plymouth county have been extremely useful to me during the last month. I was also pleased to discover that newspapers[dot]com added two Muncie newspapers to their premium membership in the last week. Having a spreadsheet to record what records I do and do not have has been extremely helpful. I feel my research is much more focused, plus I love crossing things off when I obtain a record! 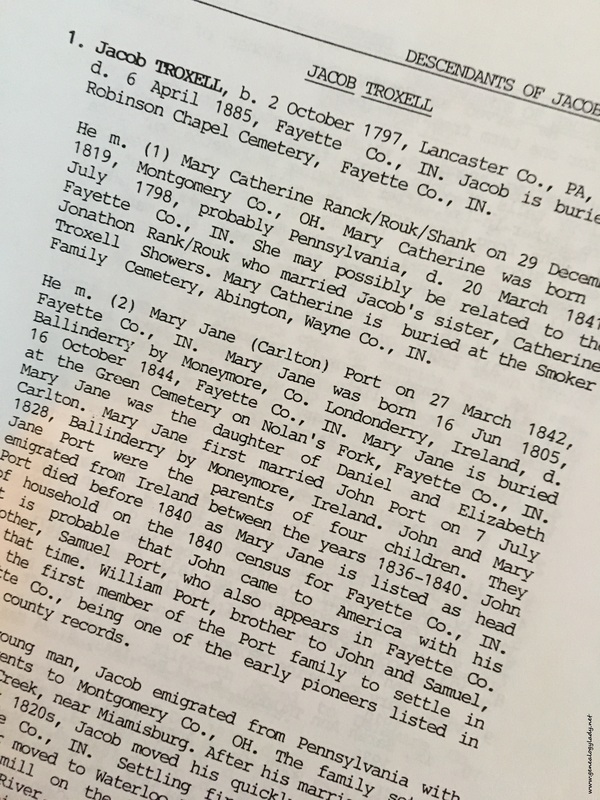 One additional research bonus…I have found it very helpful to organize my research based on the assigned number a descendant was given, both in my paper and digital files. Stay tuned for periodic updates on this endeavor in the coming months! What plans do you have to record your family history? “Who Lives? Who Dies? Who Tells Your Story? 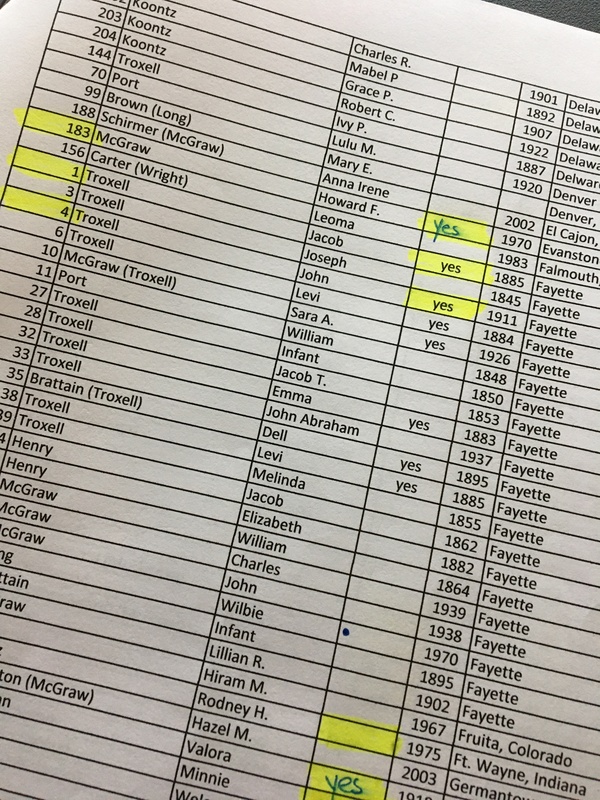 This entry was posted in Genealogy, Troxell and tagged family history, family lineage, Fayette County, genealogy, Indiana, Jacob Troxell, writing on January 11, 2017 by Deborah Sweeney.